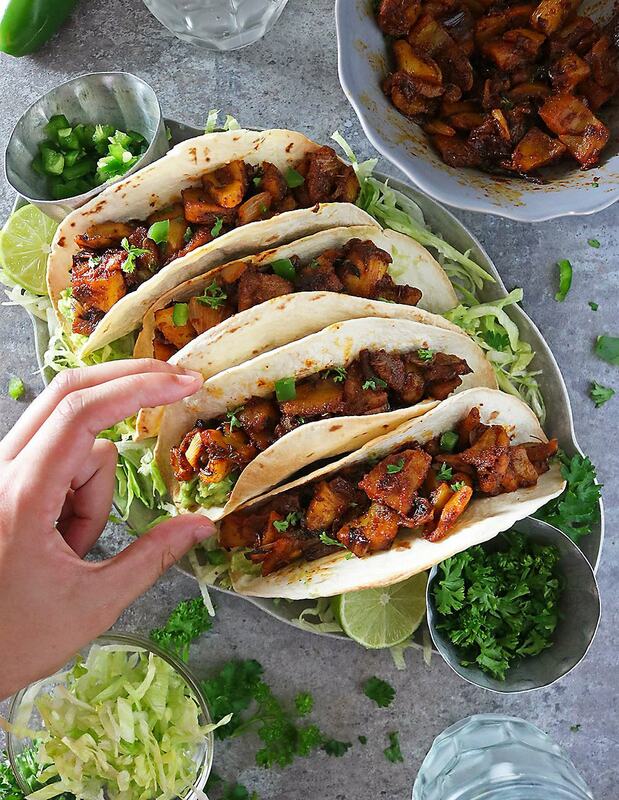 Spiced jackfruit tacos are so easy to whip up on a busy night ~ and, heavily spiced with coriander, cumin, smoked paprika, ginger and chili powder, they make for a tasty, spicealicious, vegan meal! Here in Georgia, I cannot seem to find ripe, fresh Jackfruit until the summer months. So, when I have a hankering for some jackfruit, I pick up a couple of cans of canned jackfruit. I’ve picked up canned jackfruit at Sprouts, Whole Foods, Trader Joes and a few Walmart stores as well. However, if you cannot find it at any of these, there’s good ol’ Amazon! To me, canned jackfruit is not ripe or juicy or sweet. It doesn’t have a distinctly delicious, nostril tingling aroma. In fact, it is kind of bland in taste and smell. However, there are advantages to it being bland. Like tofu, it is phenomenal at absorbing flavors it is exposed to. I usually rinse out canned jackfruit well and pat it dry as much as possible, before dousing it in spices – like I did when I make these Easy Jackfruit Tacos. Now, I’ve made these Jackfruit Tacos with ripe, fresh jackfruit as well as canned jackfruit. And, while most times I prefer fresh jackfruit, this is one time when I enjoyed eating the tacos made with canned jackfruit more than I did eating those with fresh jackfruit. What I do know is that in this case, canned jackfruit absorbed the spices I doused it with, beautifully. And, it cooked up into a delicious taco stuffing in less than 20 minutes. The texture of the cooked canned jackfruit for these tacos reminded me of pulled pork. However, it didn’t taste like pork – at least to me. It is a fruit, after all, and, it made for some delicious and easy Jackfruit Tacos – and a welcome vegan meal in our usually chicken, pork and fish studded weekly meal rotation. 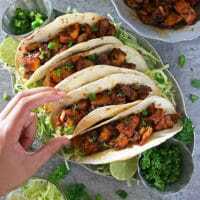 These jackfruit tacos are so easy to whip up on a busy night ~ and, heavily spiced with coriander, cumin, smoked paprika, ginger and chili powder, they make for a tasty, filling, and spicealicious, vegan meal! Jalapeno, cilantro, guacamole, shredded lettuce. Drain the jackfruit and, using a colander, rinse it well. Then pat it dry as much as you can - then, place it in a bowl. Into the bowl with the jackfruit, add in the coriander, cumin, chili, smoked paprika and mix well so the jackfruit is coated with the spices and set aside. Peel the ginger root and grate it up (I grate up a batch and save to use during the week). Add the oil to a frying pan over medium heat. Add in the chopped onion and saute about 5-7 minutes. Add in the garlic and saute a minute or so. Then add in the spiced jackfruit and saute about 7-10 minutes, stirring often during this time. When done, season with salt and pepper to taste, garnish with chopped cilantro. 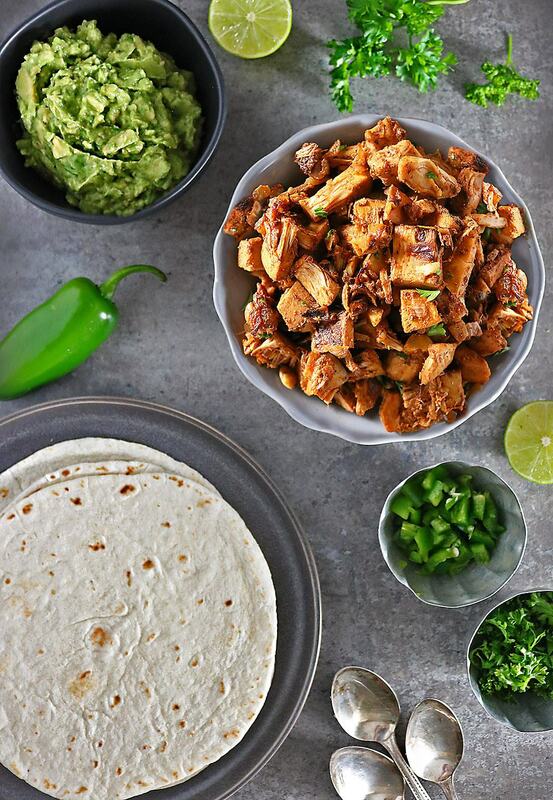 Assemble tacos with jalapeno, cilantro, guacamole, shredded lettuce and copious amounts of spiced jackfruit. Have never seen jackfruit, fresh or canned, over here. These tacos are exotic and so tempting! I didn’t know there was such a thing as canned jackfruit. Definitely looking for it! These tacos look incredibly tasty. I cant wait to try them. Perfect for dinner tonight. Thanks for the idea. I live in South Florida — so they actually sell fresh jackfruit in the stores — but they can be HUGE. Sometimes canned is better — espeically when you don’t need 5 pounds of fruit — these tacos look heavenly! This is mind blowing in so many ways 🙂 I’ve never tasted jackfruit, never knew you could get it canned, and never in a million years thought of making jackfruit tacos ~ wow, I’ve got a lot to look forward to!! When I was at my favorite International market I came across Jackfruit and was amazed at how many things you can do with it to replace meat, I am super excited to try this recipe out soon!! 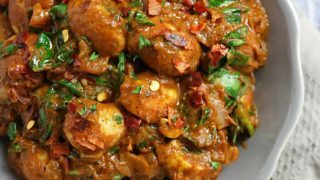 What a brilliant recipe and I love that you used jackfruit! So much flavor and deliciousness! 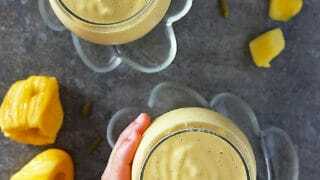 I’ve never thought of using jackfruit but now I need to give this a try! This looks so flavorful & healthy – my favorite things! I’ve seen quite a few jackfruit recipes lately, but I’ve never actually tried it yet. These tacos though! I’ll have to give this recipe a try. Would you believe I have never tried jack fruit? You make it look so appetizing in these tacos that I will surely look for it this summer. I’ve heard a lot about jackfruit but I’ve still never tried it! This looks like a great meal for Meatless Monday and this is inspiring me to try jackfruit! Never knew you could buy canned jackfruit! Makes sense, though. I almost never see jackfruit in my grocery store — only a handful of times a year. Next time I see one I’m making these tacos. Thanks! 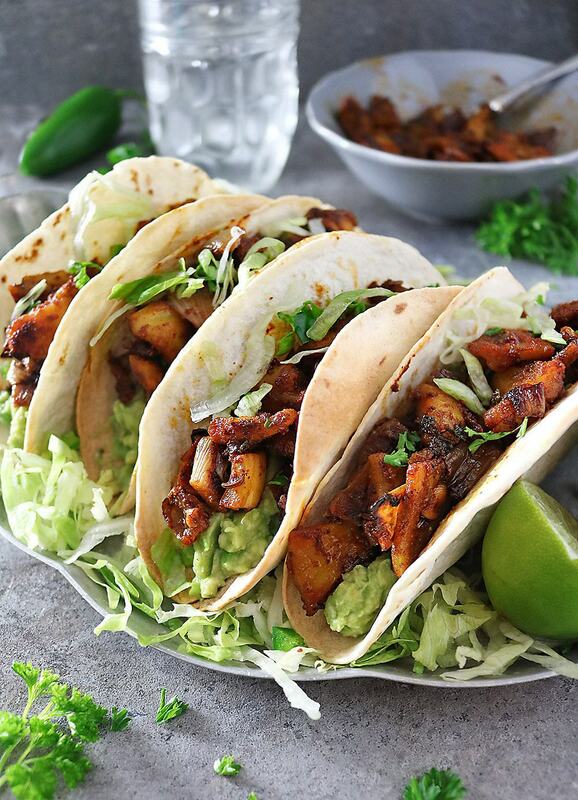 These are absolutely delicious looking tacos Shashi! Lynne and I enjoy Tacos as one of our favourite Saturday night dinners. I can’t get fresh Jackfruit here, but you mention canned jackfruit (of which I had no idea existed) so maybe I’ll have to give this a go one day!